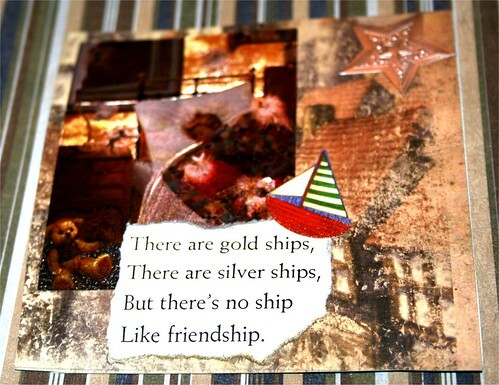 No ship like friendship 4" x 4" Collage card, originally uploaded by DianthusMoon. This is a very English card as many of it’s elements are from that country. The foil sticker of the little boy was sent to me from a friend in the UK. I send lots of things over there. I have a package of die-cuts from an English magazine (the boat and star). We all were zonked from Thanksgiving and Black Friday. Sean did his 4:30 am to 12:30 pm shift. He said it was really rough at 5 until about 6:15 with 100s of people in line. He said they looked haggard too. Crazy! I say do decorating, baking and visiting. Give a few gifts, maybe something you’ve made (I have made 2 things thus far). Tomorrow we will order a fiber glass door for the basement. I felt the first deep chill of the old door letting in the cold air. And next it will be time to get a plumber in here to unstop two bathroom sinks. It’s nasty upstairs because it takes a good 20 minutes for it to drain. I don’t think it’s too far down-must be a cap off a bottle (maybe).